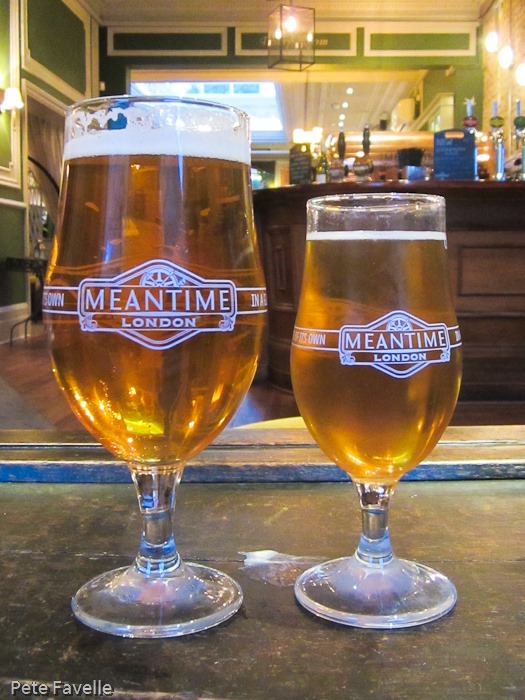 In an increasingly crowded London beer scene, breweries are always looking for ways to stand out from the crowd. 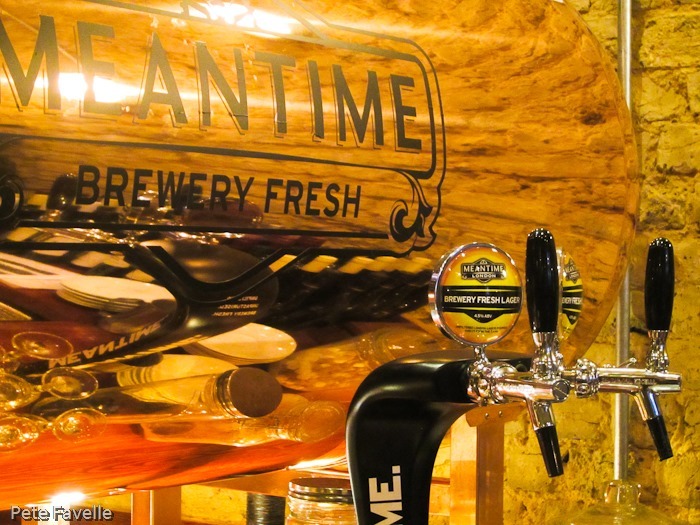 Meantime’s latest salvo is the introduction of their Brewery Fresh beer; beautiful copper tanks installed on the bar tops of (so far) a handful of Young’s Pubs close to the brewery. Although widely used in some parts of continental Europe, this sort of thing hasn’t been seen in the UK outside of brewpubs. The beer is delivered by tanker (from the position on the bar in The Grove, I can only assume this is a tanker with a very, very long hose) straight from the maturation tanks at the brewery. The tanks themselves are plastic lined – think of it as a giant, metal ‘wine in a box’ or, for the more beer-literate, a very flash looking KeyKeg – so the beer is never exposed to the air until it’s in your glass; thus the claim of being ‘brewery fresh’. Ok, enough of the marketing speak – how does it taste? Well, I’m always a sucker for a comparison so as well as the Brewery Fresh (on the left), I also grabbed a glass of the regular (kegged) London Lager (on the right). The Brewery Fresh version has a slightly more lingering head on it; the carbonation is also softer, which allows a little more of the digestive biscuit sweetness to show through. It’s ‘bigger’ overall, a touch fruitier, with the hop finish being better balanced by the fuller flavours. I’m being picky, because they’re clearly very close – I’m inclined to say that it tastes fresher, but I’m also conscious that this may be the power of suggestion. 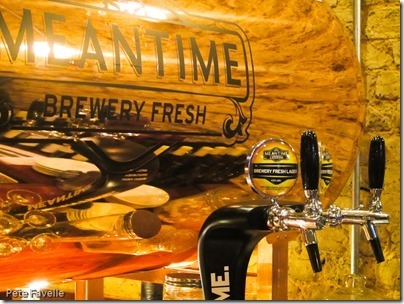 Not just suggestion, though – Meantime have very cleverly set Brewery Fresh Lager up to be served a couple of degrees warmer than standard keg. Temperature is critical to the flavour and aroma of what we eat and drink, and a warmer beer will inevitably taste slightly richer, sweeter and fruitier. So, is this innovation, or marketing? A little of both, I suspect. 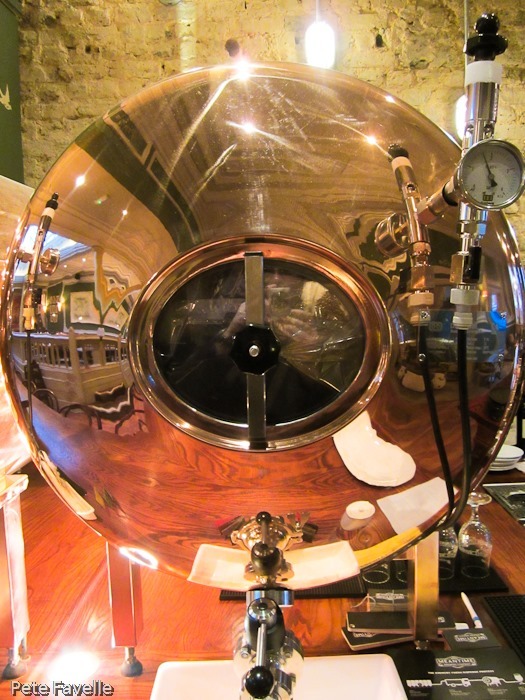 I’ve no doubt that it keeps better than a keg, but a well run pub – like the ones these tanks are going into – is unlikely to leave an old keg on anyway. The “no gas contact” dispense raises the intriguing prospect of this being a CAMRA-friendly form of London Lager and frankly, those big copper tanks are utterly irresistible. This last point is perhaps best illustrated by the fact that I overhead three different groups of punters notice the tanks on entering the pub, and decide to give it a try. Overall, London Lager is a cracking beer whatever the container and if you can find it in Brewery Fresh form it’s well worth it – I suppose ultimately it doesn’t matter how much is down to the shiny tanks and how much is down to the temperature control and marketing; it’s just a touch tastier! 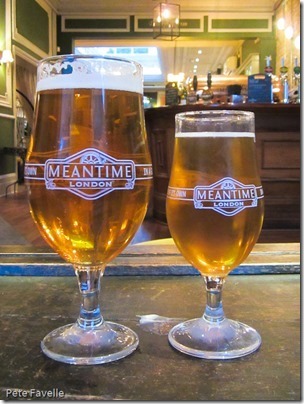 Pete Drinks was very well looked after by Meantime and the folks at The Grove. Interesting stuff; in my defense, I wasn’t spending much time in pubs in the days of Watneys! 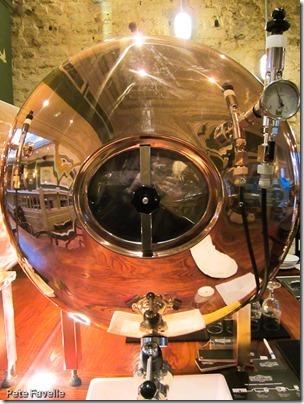 This Dutch ‘Duotank’ system has been installed serving fresh lagers & ales at ZeroDegrees, Blackheath since about 2000. Perhaps; on the rare occasions I’ve been able to taste the same beer filtered and unfiltered, I’ve never been struck by a huge difference to be honest.